Only 4 ingredients but full of flavor, these healthy breakfast cookies are best served warmed from the oven. Preheat oven to 350 degrees F. Line a baking sheet with parchment, a silpat, or lightly grease with oil. In a medium size mixing bowl, combine the oats, applesauce, cinnamon, mix well to combine. Prepare the apple, letting the mixture set a few minutes. Add the apple and mix again. Using a tablespoon measurer, scoop out well-rounded mounds of the mixture, making sure to gently pack it with your fingers, place on cookie sheet. If these aren’t packed well enough they may have a tendency to fall apart. Sprinkle the top of each cookie with sugar, this last step is optional. Place cookie sheet in the oven, on middle rack, and bake for 17 – 20 minutes. Let cool a few minutes and enjoy! Makes about 16 – 18 cookies. Store, covered, for up to 3 days. For the apple, use your favorite, green or red. I used a Fuji apple here. 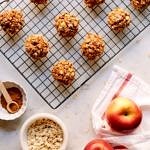 If you don’t have an apple on hand, these are just as great without the diced apple! Add in 2 tablespoons of chopped walnuts for nuttiness and extra nutrition. If you happen to use sweetened applesauce, omit the sugar in the mixture or they may be too sweet. Replace the sugar with pure maple syrup if you prefer.